Orbiting spacecrafts make highly accurate measurements of the height of the ocean surface - commonly called 'sea level' - to gather long-term information about the world's ocean and its currents. These measurements provide information about the topography of the ocean’s surface, which is used to study weather, climate, and other dynamic ocean phenomena. Ocean surface topography data also have many other applications, such as in fisheries management, navigation and offshore operations. Ocean and land topography are defined exactly the same way. Both give the height of the ocean or land above the geoid. The geoid is the shape the sea surface would have if all the currents and tides stopped. The height (or "relief") of the sea surface is caused by both gravity (which doesn't change much over hundreds of years) and the dynamic (always changing) ocean circulation. In this figure, the colors represent higher- or lower-than-normal sea-surface height. Accurate measurements of ocean surface topography are important for studying ocean tides, circulation and the amount of heat the ocean holds. The observations are used to help predict short-term changes in weather and longer-term climate patterns. Tides and currents are the two major factors that contribute to the dynamic topography of the ocean's surface. If our oceans had no tides or currents, the sea surface would assume the shape of the geoid. These "gravity anomaly" maps show where Earth's gravity field based on Gravity Recovery And Climate Experiment (GRACE) data differs from a simplified Earth model that is perfectly smooth and featureless. Areas colored yellow, orange, or red are areas where the actual gravity field is large, such as the Himalayan Mountains in Central Asia (top left of the left-hand globe) - while the progressively darker shades of blue indicate places where the gravity field is smaller-such as the area around Hudson Bay in Canada (top center of right-hand globe). Tides result from changes in gravity at Earth's surface due to the moon and Sun. Detailed information about tides can be found at NOAA's Center for Operational Oceanographic Products and Services web site. Ocean currents are streams of water flowing through the ocean, driven by wind or by the mixing of waters of differing densities. Because currents are moving bodies of water, they result in changes in the ocean surface, altering ocean surface topography by a few tens of centimeters to more than a meter. Although on a global scale this seems like a small amount, NASA’s ocean altimeter satellites can easily measure these changes, allowing data from the satellites to be used to study global ocean circulation, climate and other important areas of research. NASA currently has two satellite missions that measure ocean surface topography. Jason-1, launched in 2001 continues the measurements begun by TOPEX/Poseidon, which operated from 1992 through 2006. The follow on mission to Jason-1, the Ocean Surface Topography Mission on Jason-2 (OSTM/Jason-2), was launched in 2008 and will take this important data record into a second decade. These missions use radar altimeter systems specially designed to make extremely accurate and precise measurements of the height of the ocean surface. The satellites measure the height of the sea surface with an accuracy of about 3 centimeters (just over 1 inch) relative to the center of the Earth, and they collect data over nearly all of Earth's ice-free ocean every 10 days. This illustration of an altimetry satellite shows its orbit and its relationship to the sea surface, geoid and seafloor. From vantage points 1336 kilometers (830 miles) above the Earth, Jason-1 and OSTM/Jason-2 can measure the height of the ocean surface directly underneath the satellite with an accuracy of about 3 centimeters (just over 1 inch). The accurate determination of ocean topography is made by first measuring the precise height of the spacecraft above the center of the Earth. NASA's Global Positioning System receiver and the CNES Doris tracking system on board the satellites provide precise, continuous tracking of the spacecraft’s location. To produce accurate estimates of the satellite's orbital height, the satellite tracking information is combined with accurate models of the forces (e.g., gravity, aerodynamic drag) that govern the satellite motion. The second component of the ocean height measurement is the range from the satellite to the ocean surface. To take a measurement, an onboard altimeter bounces microwave pulses off the ocean surface and measures the time it takes the pulses to return to the spacecraft. The highly accurate altimeter range measurements are subtracted from the satellite orbital height, resulting in ocean topography measurements that are accurate to 3.3 centimeters (1.3 inches) relative to the center of the Earth. By averaging the few-hundred thousand measurements collected by the satellite in the time it takes to cover the global ocean (10 days), global mean sea level can be determined with a precision of several millimeters. For as long as both the Jason-1 and OSTM/Jason-2 satellites remain operational, they will orbit Earth in a tandem formation separated by about 330 kilometers, doubling the science data and bringing us closer to solving the global climate puzzle. NASA and the French space agency, CNES, are joint partners in the Jason-1 mission. 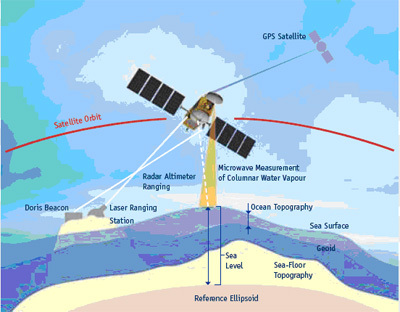 OSTM/Jason-2 is a multi-partner collaboration among NASA, CNES, NOAA and the European Organisation for the Exploitation of Meteorological Satellites (EUMETSAT) that will continue the long-term ocean surface topography data record. Image of the Pacific Ocean in November 1997, produced using sea surface height (SSH) measurements taken by the U.S./French TOPEX/Poseidon satellite. 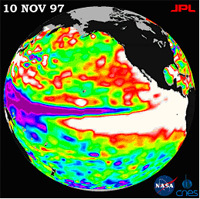 Learn more about El Niño and La Niña. Ocean surface topography data have a wide spectrum of scientific applications. Altimeter data have been instrumental in observing the rise and fall of the El Niño and La Niña and, more recently, the Pacific Decadal Oscillation. Ocean topography often corresponds to the amount of heat stored in the upper layers of the ocean. This information is useful in predicting hurricane season severity and forecasting individual storm severity. Altimetry data also provide ctitical contributions to our knowledge of even longer-term phenomena such as global sea level rise. Over the next few decades, scientists will continue to study these climate, weather and ocean circulation phenomena to better understand their impact on our environment and our daily lives. In addition to their value as a research tool, ocean surface topography data also have many practical and operational applications. They are used in ship routing, offshore oil operations, fisheries management, recreational boating, oil spill remediation, as well as search-and-rescue and naval maritime operations. Ocean altimeter data have been used to help understand the behavior of Stellar sea lions and the migratory habits of hawksbill turtles and whales tracked by other satellites. The information ocean topography data provide on the extent and degree of ocean warming is important for coral reef research. There are also land applications of ocean altimetry data. Near real-time data of the height of water in rivers and lakes is used for flood and drought investigations. Altimetry also provides a measurement of river level variations, which is especially useful in areas that are difficult to reach such as the Amazon River basin. Altimetry data also help to monitor Greenland ice sheet growth rates. Scientists and engineers working on the OSTM/Jason-2 mission have developed technologies and data methodologies that will result in even more accurate measurements of sea-surface height than previous missions could provide. The new altimeter systems can observe changes in ocean surface topography with an accuracy of one to two centimeters. Ocean surface topography data are also being combined with other measurements to help scientists and forecasters better understand the link between the ocean and short and long-term changes in climate and how Earth’s climate may respond to changes in carbon dioxide in the atmosphere and to man-made changes on land.